In getting deeper into the "Cash Recycling" concept domain it is recommended to focus in four separate areas. It is the Euro banknotes regulatory framework, the specialized equipment enabling compliance and the positive implications in the retail banking paradigm. Once we leverage properly on the later, then will realize significant operating expenses reduction which will imply a strong return on investment for the relevant project; this is by itself a fourth area of interest. Below there is an assortment of frequently asked questions providing information and clarity, grouped under the heading of the four primary areas mentioned above. What is the role of ECB in the regulatory framework? The ECB and the National Central Banks (NCBs) of the Eurosystem, being the issuing authorities for the Euro banknotes are tasked with maintaining public trust in the single currency. This is done, among other things, by ensuring the integrity of the euro banknotes in circulation (re: EU Council Regulation (EC) No 1338/2001). For this reason, the Governing Council of the ECB adopted on 16 September 2010 the Decision ECB/2010/14 on the authenticity, fitness checking and recirculation of euro banknotes, which became applicable on 1 January 2011. Thus ECB is the regulatory authority in the context of Euro banknotes handling. What is the role of an NCB, as the BoG, in the regulatory framework? In this context ECB adopted common procedures for the testing of banknote handling machines by NCBs who will report back to ECB the successfully tested machines. Furthermore NCBs are responsible to ensure that the Euro banknotes they deliver to cash handlers are authentic and fit, as per ECB/2010/14. NCBs may occasionally demand stricter settings for authenticity and fitness checking, which have to be agreed with the cash handlers and be communicated to ECB. NCB are responsible to accept and collect or the unfit Euro banknotes as their last destination in the overall recycling process. NCBs may grant remote branches of credit institutions with a low level of cash operations permission for trained staff members to carry out manual fitness checking of euro banknotes to be recirculated via customer–operated machines or cash dispensers, provided that authenticity checking is carried out by a type of banknote handling machine successfully tested by an NCB. Each NCB shall ensure that the volume of euro banknotes manually checked, as per established regulation exceptions, does not exceed a maximum of 5 % of the overall volume of euro banknotes which are distributed annually via customer–operated machines or cash dispensers. NCBs shall decide whether the 5 % threshold shall apply at the level of each credit institution or at that of all credit institutions at national level. NCBs may review and provide consent where an exceptional event occurs as a result of which the euro banknote supply in a Eurosystem member state is significantly impaired. In this case, subject to NCB’s agreement, the cash handlers’ trained staff members may, on a temporary basis, carry out manual authenticity and fitness checking of euro banknotes to be recirculated via customer–operated machines or cash dispenser. NCBs are authorised (subject to national law requirements), (i) to carry out on–site inspections, including unannounced ones, at cash handlers’ premises to monitor their banknote handling machines, in particular the machines’ capacity to check for authenticity and fitness and to trace suspect counterfeit euro banknotes and euro banknotes that are not clearly authenticated to the account holder; (ii) to verify the procedures governing the operation and control of the banknote handling machines, the treatment of checked euro banknotes and any manual authenticity and fitness checking; and (iii) to take samples of processed euro banknotes to check them at their own premises. NCBs, in the context of the cash handlers on–site inspections and in the case that detect non–compliance with the provisions of the ECB/2010/14 Decision, have to require the adoption of corrective measures within a specified time limit. Until the non–compliance is rectified, the requiring NCB may, on behalf of the ECB, prohibit the cash handler from recirculating the banknote denomination(s) concerned. If the non–compliance is due to a failure of the type of banknote handling machine, this may lead to its removal from the relevant ECB list. NCBs are tasked to report to ECB a particular cash handler as non–compliant, in case that does not cooperate with regard to an inspection. NCB is the recipient of cash handlers mandatory reporting (i) before a type of banknote handling machine is put into operation; and (ii) cash handling statistical information as specified in Annex IV "DATA COLLECTION FROM CASH HANDLERS", at page 15 of ECB’s decision 2010/14 on the authenticity and fitness checking and recirculation of euro bank notes. Additionally an NCB may decide, for monitoring reasons, to collect the data at local level, such as at branch offices. The NCBs and the ECB may decide to publish reports or statistics using data acquired. Any such publication is aggregated in such a way that no data can be attributed to single reporting entities. What are the responsibilities of a cash handler, as a bank, in the context of cash recycling? Fundamental responsibility of cash handlers is the obligation to check euro banknotes for authenticity and fitness in line with procedures laid down in the Decision ECB/2010/14 on the authenticity, fitness checking and recirculation of euro banknotes. Cash handlers have to comply with the main requirement that Euro banknotes may only be recirculated via customer–operated machines or cash dispensers if they have been checked for authenticity and fitness by a type of banknote handling machine successfully tested by an NCB and classified as genuine and fit. However, this requirement shall not apply to euro banknotes that have been delivered directly to a cash handler by an NCB or by another cash handler that has already checked the euro banknotes for authenticity and fitness in this manner. Cash handlers may use staff–operated machines, for the purpose of authenticity and fitness checking, while customer–operated machines may only be used if they have been successfully tested by an NCB and listed on the ECB’s website. The machines shall be used with the standard factory settings, including any updates thereof, that have been successfully tested unless stricter settings are agreed between the NCB and the cash handler. Cash handlers are responsible to hand over to the competent national authorities, within a maximum of 20 working days, any banknotes that are not authenticated as genuine euro banknotes following classification carried out in accordance with Annex IIa and IIb "CLASSIFICATION AND TREATMENT OF EURO BANKNOTES BY CUSTOMER OR STAFF–OPERATED MACHINES", at page 7 of ECB’s decision 2010/14 on the authenticity and fitness checking and recirculation of euro bank notes. Cash handlers must ensure availability of trained staff members (i.e. competent to check euro banknotes for authenticity and fitness) who may, on a temporary basis, and subject to the relevant NCB’s agreement that the situation is exceptional, carry out manual authenticity and fitness checking of euro banknotes to be recirculated via customer–operated machines or cash dispensers; this is only in case where an exceptional event occurs as a result of which the euro banknote supply in a Member State is significantly impaired. Cash handlers have to cooperate with an NCB with regard to a possible inspection, otherwise lack of cooperation shall be considered as non–compliance. Cash handlers are tasked with data collection and regular reporting aiming to enable the NCBs and the ECB to monitor the cash handling activities and to oversee developments in the cash cycle. Cash handlers which have outsourced authenticity and fitness checking to other cash handlers may be requested to provide detailed information to the NCB on the latter. Are there any audits to cash handlers (incl. banks) by regulatory authorities? Are there any sanctions in case of failure to comply to cash recycling regulation? What if a bank is lacking specialized equipment for banknotes checking and sorting? Each NCB shall ensure that the volume of euro banknotes manually checked, as per established regulation exceptions, does not exceed a maximum of 5% of the overall volume of euro banknotes which are distributed annually via customer–operated machines or cash dispensers. NCBs shall decide whether the 5% threshold shall apply at the level of each credit institution or at that of all credit institutions at national level. Any cash handler, who is lacking specialized equipment for banknotes checking and sorting, or adequate processing capacity, may outsource the checking to another cash handler. Is there any difference in cash recycling regulation in case of customer–operated machines? Euro banknotes may only be recirculated via customer–operated machines or cash dispensers if they have been checked for authenticity and fitness by a type of banknote handling machine successfully tested by an NCB and classified as genuine and fit. However, this requirement shall not apply to euro banknotes that have been delivered directly to a cash handler by an NCB or by another cash handler that has already checked the euro banknotes for authenticity and fitness in this manner. Is it difficult to comply with regulation by implementing manual fitness checking in banknotes? In case of customer operated machines it is mandatory to use cash that has been checked for authenticity and fitness by a type of banknote handling machine successfully tested by an NCB and classified as genuine and fit. However, this requirement shall not apply to euro banknotes that have been delivered directly to a cash handler by an NCB or by another cash handler that has already checked the euro banknotes for authenticity and fitness in this manner. Any cash handler, who is lacking specialized equipment for banknotes checking and sorting, or adequate processing capacity, has to outsource the checking to another cash handler. However NCBs may grant remote branches of credit institutions with a low level of cash operations permission for trained staff members to carry out manual fitness checking of euro banknotes to be recirculated via customer–operated machines or cash dispensers, provided that authenticity checking is carried out by a type of banknote handling machine successfully tested by an NCB. Each NCB shall ensure that the volume of euro banknotes manually checked, as per established regulation exceptions, does not exceed a maximum of 5% of the overall volume of euro banknotes which are distributed annually via customer–operated machines or cash dispensers. NCBs shall decide whether the 5% threshold shall apply at the level of each credit institution or at that of all credit institutions at national level. ECB in Annex IIIb at page 14 of the decision 2010/14, lays down the minimum standards for manual fitness checking of euro banknotes by trained staff members. It is a list of twelve (12) sorting criteria. Is that possible to delay recycling equipment installation in small/remote bank branches? To apply for this permission, credit institutions shall provide the NCB of their Member State with evidence of the remoteness of the branch in question and the low level of its cash operations. Each NCB shall ensure that the volume of euro banknotes manually checked in this manner does not exceed a maximum of 5% of the overall volume of euro banknotes which are distributed annually via customer–operated machines or cash dispensers. NCBs shall decide whether the 5% threshold shall apply at the level of each credit institution or at that of all credit institutions at national level. What is exactly the regulatory requirements in regards to counterfeit banknotes traceability? Traceability of suspect counterfeit banknotes is defined as the ability to associate the subject banknote(s) with information related to the account holder. This information should be retained until the counterfeit banknote(s) are delivered to the competent national authorities, which should be no later than 20 working days after the banknotes have been detected by the machine. What is the to–date trend of not–fit banknotes in circulation? The fitness quality threshold is fixed as defined by ECB, or may change? Is there any routine reporting required, in the context of the present regulatory framework? In order for the ECB and the NCBs to monitor the compliance of cash handlers with the Decision ECB/2010/14 on the authenticity, fitness checking and recirculation of euro banknotes, which became applicable on 1 January 2011, and to oversee developments in the cash cycle, NCBs are tasked to collect regular reporting provided by cash handlers. Bank of Greece published on December 2010 a Technical Specifications Document on Cash Recycling data reporting. Acquiring specialized cash recycling equipment, or ceasing their operation, should be reported? Cash handlers mandatory reporting includes an ad-hoc report to NCB, before a type of banknote handling machine is put into operation as well as whenever it is removed from operation. Same information is anyway included in the periodic report (every 6 months) as per Annex IV "DATA COLLECTION FROM CASH HANDLERS", at page 15 of ECB/2010/14. What is ECB’s taxonomy of cash handling equipment? What are the primary capabilities of TCR equipment as per ECB regulation? TCRs (a.k.a. TARMs as per ECB nomenclature), are cash recycling machines operated by cash handlers that check euro banknotes for authenticity and fitness. For withdrawals, TCRs may use genuine fit euro banknotes that have been deposited by other customers in previous transactions. In addition, they keep euro banknotes in safe custody and allow cash handlers to credit or debit the bank accounts of customers. Is it required that a TCR equipment is certified in regards to regulatory compliance? Yes, it is required. A TCR to qualify as an ECB compliant banknote handling machine, it has to be capable of processing batches of euro banknotes, classifying the individual euro banknotes and physically separating the euro banknotes according to their classifications without the intervention of the machine operator, subject to Annex IIa and IIb "CLASSIFICATION AND TREATMENT OF EURO BANKNOTES BY CUSTOMER OR STAFF–OPERATED MACHINES", at page 7 of ECB’s decision 2010/14 on the authenticity and fitness checking and recirculation of euro bank notes. Banknote handling machines need to have the required number of dedicated output stackers and/or other means to ensure the reliable separation of the euro banknotes processed. Also, they have to be adaptable to ensure that they are capable of reliably detecting new counter–feits, as well as to enable the setting up of more or less restrictive fitness sorting standards, if applicable. As regards to the minimum standards for automated fitness checking of euro banknotes they are laid out by ECB in Annex IIIa, at page 11 of ECB’s decision 2010/14 on the authenticity and fitness checking and recirculation of euro bank notes. The acceptable tolerance level for the fitness checks by banknote handling machines is 5%. This means that a maximum of 5% of the euro banknotes that do not meet the fitness criteria may be misclassified by the machines and sorted as fit. How much space do I need to install a CM18 TCR? Having one of the smallest operational and service footprints, the CM18 can be installed in the smallest of branch or office space without the need of any refurbishment. The dimensions of the CM18, differ according to the selected configuration and safe’s certification. Can I adjust the opening side of the door? The CM18 can be supplied with either a left or right hand hinged door – enabling the device to be situated next to a wall. What desk configuration should we use in order to fit the CM18? The compact size and flexible design of the CM18 ensures that it will fit into the vast majority of teller desk configurations with little or no change. Which standards are implemented in the CM18 TCR regarding the physical and logical security? UL291, CEN L, CEN3, CEN4 safes with standard options of floor anchorage is implemented in the CM18, further supported by alarm sensors and provision of secure locks. Safe door opening can be software controlled. Optionally secure communications software (TCP/IP V6–IPSEC) through dedicated Windows CE board can be introduced. Is it obligatory to save the processed banknote in the CM18’s cassettes? The CM18 can be used for standard banknote counting, sorting, fitness checking and validation, using the 3 top input/output slots. The processed banknote may either stored in a cassette, or may return back to the output slot, depending on the teller requested type of transaction. Can we be sure that only authorized staff will have access to the TCR? Configurable access controls ensure that only authorized users can communicate with the device, as defined by a supervisor, or designated member of staff. Communications between Host and TCR may be encrypted using standard techniques. Can CM18 be shared to more than one teller? What is meant by "Island Mode"? In "island mode", the TCR is shared by several users. Transactions are accepted and stored in the device and are executed when the operator identifies themselves using their access credentials. The CM18 can be located immediately behind the teller positions or further away in a more secure location. How many currencies can be supported? The reader of the CM18 can store up to 16 currencies, each with up to 32 denominations. Is it possible to recycle more than one currency concurrently? Up to 4 different currencies, with 32 denominations per currency, can be processed simultaneously. Is it possible to add recycling modules in the future? The CM18 and the CM18T offer a scalable capacity that can grow from 6 to 12 recycling modules at any time. This is achieved simply by inserting more modules. What is the storage capacity of the CM18 TCR? The recycling (and storage) cassettes of the CM18, have a capacity of 500 banknotes each. What is the capacity of the input/output slots? The capacity of the input slot is 200 banknotes. Accordingly the output slot can be programmed to dispense in batches of up to 200 banknotes. What is the deposit/dispense speed of the CM18? The deposit speed is 5 notes per second, while the dispense speed is 7 notes per second. What if one or more cassettes fill–up during the working hours? Since the volume of banknotes in circulation varies by denomination, the capacity of cash recyclers is often compromised as some cassettes will fill up faster than others. "Virtual cassettes" enable the distribution of one denomination across several recycling modules without impacting the application software. "Balanced cash handling" enables the even distribution of notes among these modules. This ensures that in the unlikely event of failure of one of the modules, cash operations are unaffected. What is the use of the CM18’s Touch–Screen? Is it possible to provide real–time data to other external systems? The CM18 has the ability to communicate concurrently over multiple communication channels, thus to be constantly interfaced to Cash Management system, Teller application, Helpdesk support, system management and others. What types of sensors are used for the validation and fitness–sorting? Full image sensors for Visible, UV & IR light plus magnetic and ultra sounds sensors are implemented in the CM18. Who has developed the banknote reader of the CM18? The ARCA recyclers use high–end technology readers with validation and fitness sorting capability, developed internally. Which interface is provided for the CM18 connection? To what extend can a retail bank branch be autonomous in regards to cash recycling? All customer deposited cash cannot be recirculated via customer–operated machines (such as ATM’s) unless they are checked for authenticity and fitness by a type of banknote handling machine successfully tested by an NCB and classified as genuine and fit. Cash disbursed upon customer withdrawals, over the counter, must be genuine and fit. The relevant fitness checking may be performed either by specialised banknote handling machines or by trained staff members, in any case ensuring adequate level of quality. Cash collected upon customer deposits must be collected and go through fitness sorting processing, where unfit banknotes are returned back to NCB for recycling. Typically retail banks that do not have banknote handling machines for fitness checking, successfully tested by an NCB, are outsourcing this service. Hence they undertake both the cost of fitness sorting and the cash–in–transit (CIT) service. A retail bank branch office may get a high level of autonomy in cash fitness checking by installing a Teller Cash Recycling machine. Thus, (a) upon cash deposits the unfit banknotes will be removed and stored separately, (b) on cash withdrawals only fit banknotes will be used and (c) the TCR machine may produce a batch of fit banknotes, of the appropriate denomination, which may be used to feed the branch customer–operated machines (such as ATMs). What are the implications of TCR equipment having an integrated vault? TCRs are an efficient and secure way to store cash. In traditional branches, cash is typically stored in drawers up to a maximum amount. Any cash above this threshold must normally be transferred to the vault of the Branch, during and at the end of the working day. In contrast, in branches equipped with TCRs, cash can be safely stored in the units. The bank may establish an open office layout, where the teller is not anymore behind a glass protected counter. The teller has an increased sense of safety and security by handling any amounts of cash, which is retained in safe custody. Combined with the open office concept, now the teller is more a customer relationship agent, than a bank teller. Anytime during the day, the TCR is fully aware of the total cash value retained in safe custody into the micro vault; this information is propagated to the core banking system, so that the "Bank" has near real–time information in regards of the "floating" cash in the network. Given the large capacity of the TCR micro–vault, there is not any more the need to transfer cash between the teller workstation and the branch vault. Even the end–of–day closure does not necessarily entail physical cash transfer in the branch. When the time comes for CIT services to collect cash from the branch, then this operation is performed faster, simpler and safe with a highest sense of accuracy. This is true, since the TCR is fully aware of the total value of cash retained in safe custody into the micro vault; thus, may produce batches of banknotes checked and counted, ready for "change of custody" to the hands of CIT service personnel. Last but not least it is reducing the risk of robberies and enhancing staff security. To what extend the bank teller is advancing his role, when supported by a TCR? The deployment of a TCR may change the life and behavior of a traditional teller. Given that TCR is managing cash, ensuring accurate counting, authentication and fitness checking, and is keeping the banknotes in safe custody into the integrated micro vault, it is simplifying the traditional cash handling activities of a teller. In a typical deposit transaction, the batch of banknotes is automatically processed by the TCR system, the checked cash is stored in the vault, and the IT system is notified for the amount and the positive transaction completion. Likewise is the series of TCR actions in a withdrawal transaction. Eventually, at the end of the day, the consolidation is a matter of seconds. This is opening a new era in the teller role. The customer will realize a new style of direct communication with a bank representative who is not anymore a "teller". He is a customer relationship agent, with a consulting role towards the customer. Now the customer will have the opportunity to discuss with a "banking agent", sitting in an ordinary office, exploring beyond the withdrawal/deposit transaction other possible solutions and services. Can TCR contribute to branch ATM’s cash replenishment routine procedure? A retail bank, as a euro banknotes cash handler is subject to ECB/2010/14 framework on the authenticity, fitness checking and recirculation of euro banknotes. When it comes to customer–operated machines (such as ATMs), the cash cannot be recirculated unless checked for authenticity and fitness by a type of banknote handling machine successfully tested by an NCB and classified as genuine and fit. Thus typically the cash replenishment of ATMs is using checked/sorted batches of banknotes provided by outsourced cash handlers via CIT services. However, the availability of a TCR machine in the branch, may produce at any time, batches of fit banknotes, of the appropriate denomination, which may be used to feed the branch customer–operated machines (such as ATMs). Can a TCR operate in an open space retail banking branch environment? A Teller Cash Recycler (such as the ARCA CM18) which is incorporating a micro vault, is a key enabler for retail bank branch office transformation, establishing an open office layout, where the teller is not anymore behind a glass protected counter. Now the teller has an increased sense of safety and security by handling any amounts of cash, which is retained in safe custody. Combined with the open office concept, the teller is more a customer relationship agent, than a traditional bank teller. Can, a TCR equipped retail bank, have near real–time floating cash information? A Teller Cash Recycler (such as the ARCA CM18) is at anytime during the day fully aware of the total cash value retained in safe custody into the micro–vault; this information is propagated to the core banking system, so that the "Bank" has near real–time information in regards of the "floating" cash in the network. What is the TCR contribution in large volume banknotes deposits (e.g. retail merchant customer)? What are other recommended applications for a TCR outside a retail bank branch? A Teller Cash Recycler (such as the ARCA CM18) proved as the ideal tool to implement the so–called "Remote Cash Management" (RCM). The RCM process is an emerging opportunity for both banks and retailers. Merchants place their cash into Cash Recyclers. The TCRs capture the denomination and the amount of each banknote, while simultaneously checking its authenticity. The financial totals are then transmitted, via a secure connection, to the bank for provisional credit posting. By receiving credit for their funds placed into their TCR smart safes, merchants and banks may reduce drastically the number of CIT trips, while other smart solutions, as ATM’s cash replenishment, may be implemented. RCM enables the centralization of banking relationships since merchants no longer need to select banks based on proximity to stores. What is the TCR technology adoption by the retail banking industry to–date? A key reason for the growing investment in Teller Assistant Units (TAU) is the increasing use of Cash Recyclers. TCRs accounted for 29% of TAUs in 2008, compared to just 10% in 2001. They can handle more transactions than simple dispensers and also redispense genuine fit deposited notes, reducing dramatically the number of CIT trips. It is not surprising that TCRs are enjoying increasing popularity given the many advantages they provide banks in terms of improved accuracy and efficiency. One of the primary drivers of TCR deployment is its ability to reduce transaction times by up to 75% at tellers, thereby shortening queues. TCRs are also an efficient and secure way to store cash. In traditional branches, cash is typically stored in drawers up to a maximum amount. Any cash above this threshold must normally be transferred to the vault of the Branch, during and at the end of the working day. In contrast, in branches equipped with TCRs, cash can be safely stored in the units. The total number of TAUs in 25 countries surveyed is forecasted to increase by 65%, from 145,000 in 2008 to around 240,000 in 2013. The share of TCRs is forecasted to grow from 29% to 66% between 2008 and 2013. How CIT routine services will be affected by installing TCR machine in a bank branch? Can TCR contribute in controlling the "floating cash" in the retail banking network? In a typical retail bank branch office lacking Cash Recycling machine, the cash collected from customer deposits has to be forwarded via CIT services to a cash processing center (frequently outsourced) for fitness check. Thus cannot be re–used (recirculated) to customers, and particularly via customer–operated machines (such as ATMs), as per ECB’s decision 2010/14 on the authenticity and fitness checking and recirculation of euro bank notes. Therefore branch ATMs cash replenishment necessitates fresh cash, checked for fitness, supplied regularly via CIT services. Apparently the "floating" cash in the branch is a multiple of the amount strictly required for the routine transactions of withdrawals via ATMs and the teller counter, as the cash cannot be recirculated before checked for fitness. 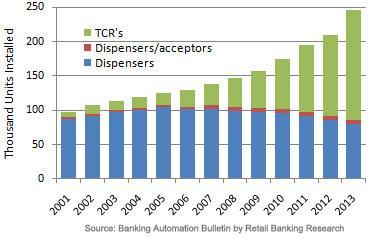 Once the branch is equipped with one or more TCR (Teller Cash Recycler) machines, then it getting an autonomy to large extend on re–using (recirculating) the cash collected from customer deposits, since Teller Cash Recycler(such as the ARCA CM18) may produce on–request batches of specific denomination banknotes, checked for fitness, ready to feed the ATM cartridges. Same is true for customer withdrawals over the counter. Hence no overlaps required anymore in the cash amounts retained in branch, to ensure acceptable customer service level and regulatory compliance, the floating cash in branch is reduced approximately by 50%. Propagating the above across the whole retail banking network, the net effect in floating cash may account to million euros. Find out more, by reading our article titled "TCR’s Deployment ROI in Retail Banking Network", in the ROI section. Can TCR contribute in reducing the cash handling/processing costs? Once the branch is equipped with one or more TCR (Teller Cash Recycler) machines, then it getting an autonomy to large extend on re–using (recirculating) the cash collected from customer deposits, since Teller Cash Recycler (such as the ARCA CM18) may produce on–request batches of specific denomination banknotes, checked for fitness, ready to feed the ATM cartridges. Same is true for customer withdrawals over the counter. Hence no overlaps required anymore in the cash amounts retained in branch, to ensure acceptable customer service level and regulatory compliance, the floating cash in branch is reduced approximately by 50%. Find out more, by reading our article titled "TCR’s Deployment ROI in Retail Banking Network", in the ROI section. How can assess the teller productivity enhancement when supported by a TCR? The deployment of a TCR may revamp traditional teller productivity and change his/her life and behavior. Given that TCR is managing cash, ensuring accurate counting, authentication and fitness checking, and is keeping the banknotes in safe custody into the integrated micro vault, it is simplifying the traditional cash handling activities of a teller. In a typical deposit transaction, the batch of banknotes is automatically processed by the TCR system, the checked cash is stored in the vault, and the IT system is notified for the amount and the positive transaction completion. Likewise is the series of TCR actions in a withdrawal transaction. Eventually, at the end of the day, the consolidation is a matter of seconds. Given the vastly increased processing speed of routine deposit and withdrawal transactions, it is possible to reduce the number of tellers, while the customer service level will be definitely improved and the queues shortened. Find out more, by reading our article titled "TCR’s Deployment ROI in Retail Banking Network", in the ROI section. What are the OpEx or other cost elements that may be reduced by installing TCR's? Find out more, by reading our article titled "TCR’s Deployment ROI in Retail Banking Network", in the ROI section. How can be assessed the ROI upon TCR deployment across a retail banking network? A first approach assessment can be performed by our "ROI Calculator", found in the ROI section. This is based on specific operational parameters profiling the subject branch. A more detailed overview can be found in our article titled "TCR’s Deployment ROI in Retail Banking Network", in the same section. What are the primary sensitivity elements affecting the ROI in a potential TCR deployment project? A more detailed overview can be found in our article titled "TCR’s Deployment ROI in Retail Banking Network", in the ROI section. Is there a breakeven point where TCR support is not providing ROI, such as in a small branch? Although the ROI upon installing a single TCR machine in a retail bank branch is typically quite high to justify the project, however there may be situations of very low business branches that do not justify the deployment of a TCR in the teller counter. This rarely may happen, since such low business level should not justify the operation of a branch office in the first place. A first approach assessment can be performed by our "ROI Calculator", found in the ROI section. By supplying the operational parameters profiling a business case, you will get the relevant OpEx savings and the ROI indices. It is possible to provide very low business traffic numbers to check the ROI sensitivity and identify the break–even point. Most likely it will be that low, that no such actual branch will be in your retail banking network.